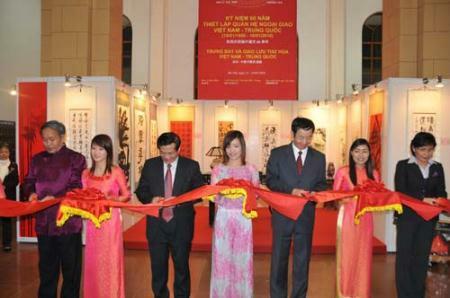 HANOI, Jan. 21 (Xinhua) -- A beautiful exhibition of painting and calligraphy works by Chinese and Vietnamese artists was held here on Thursday as part of a series of cultural activities to celebrate the 60 years of diplomatic ties between the two countries. prelude to the 2010 "China and Vietnam Friendship" culture exchange year. 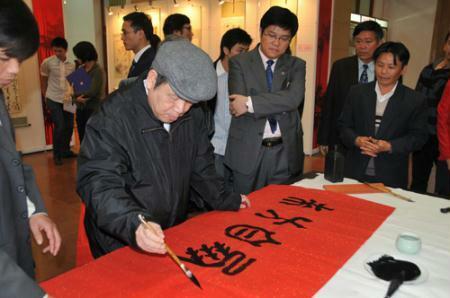 Ten Chinese artists came from China's northern Tianjin Municipality with their works to participate in the exhibition. Around 60 works by calligraphers and painters of the two countries were on display. "The cultural exchange between Vietnam and China has been intensive in recent years," said Chinese ambassador to Vietnam Sun Guoxiang at the exhibition. "The exhibition is a great opportunity for the two peoples to share their splendid culture. It will help consolidate traditional friendship between the two countries," said Tran Chien Thang, vice culture, sports and tourism minister of Vietnam at the exhibition. The exhibition was held in Vietnam's southern Ho Chi Minh City last week. Calligraphy Exhibition in Hanoi, capital of Vietnam, Jan. 21, 2010.